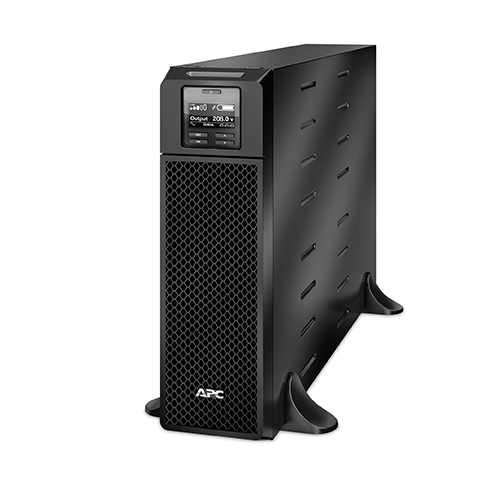 The APC SRT5KXLT, APC Smart-UPS online 5000VA 208V UPS is network manageable via serial, USB or optional Ethernet. Includes Powerchute® Network Shutdown Software for convenient monitoring and control, safe operating system shutdown, and innovative energy management capabilities. The SRT5KXLT provides pure sine wave output which is recommended by server manufacturers using active power factor corrected (PFC) power supplies. Safety agency tested and approved means that you can deploy Smart-UPS with confidence that they meet or exceed the industry’s most rigorous standards. Network grade power conditioning protects from damaging surges and disruptive noise. The double conversion architecture provides tight voltage regulation, frequency regulation ,and zero transfer time to battery during power events. Intelligent battery management, pioneered by APC, maximizes battery performance and life through intelligent, precision temperature compensated charging. Automatic self tests insure battery reliability and warn customers in advance of battery replacement.